Fall tillage practices will impact two important soybean diseases, soybean white mold and sudden death syndrome. There is a lot of tillage of bean stubble taking place this fall in Iowa, in reaction to the severe SDS outbreaks during the summer. Because of the summer flooding and outbreaks of soybean sudden death syndrome this past growing season, more tillage has been done this fall in Iowa than the past few years. "The extensive amount of tillage can be seen while driving on Iowa highways, a similar situation we saw after 1993 floods," says X.B. Yang, an Iowa State University plant pathologist and a soybean disease expert. 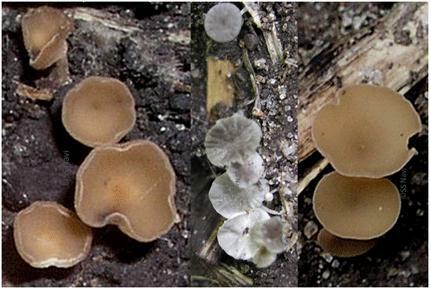 White mold mushrooms (left and right) and other mushroom (center white). Photo by SS Navi. Fall tillage practices will impact these two important soybean diseases--soybean white mold and sudden death syndrome, says Yang. White mold disease was widespread during the 2009 growing season and SDS was prevalent in both 2009 and 2010. In the following article, Yang discusses the implications of tillage on these two diseases. A large-scale study suggests that no-till fields have a lower risk of soybean white mold than tilled fields. Tillage determines the placement of sclerotia or distribution of sclerotia in the soil. Sclerotia buried deeper than 2 inches in soil will not germinate and these left on the soil surface will germinate even in corn fields if conditions are right. Tillage this fall will greatly affect the white mold next year. Early this summer, the temperatures were cool and there were reports of mushroom production seen by farmers and agronomists. Some mushrooms are white mold mushrooms and some look like white mold mushrooms (see photo), but are bird-nest mushrooms (see previous ICM article). The production of mushrooms in the past summer will reduce the amount of white mold sclerotia if no-till was used for the 2010 season. However, if the field was tilled in the fall of 2009, large loads of sclerotia would have been buried in the soil and not germinated. For these fields, the risk can be reduced if no tillage has been made and will not be made next spring. Use of tillage after the 2010 growing season, in the fall or next spring, will bring up buried sclerotia to the soil surface, which can increase the disease risk. Use of tillage to control SDS has been extensively discussed. From the soil conservation consideration, tillage increases erosion and production cost. So it is not encouraged. If you have done tillage, it will not increase the risk for SDS infestation, as it does for white mold. Published literature over the last 20 years consistently showed a higher risk of SDS in no-till than in tilled fields. No data from peer-reviewed publications have suggested no-till can reduce SDS. SDS is more severe under no-till than other tillage practices because of the cooler soil and higher soil moisture during spring in no-till fields. Tillage increases soil temperatures and reduces spring soil moisture which reduces the risk of soybean sudden death syndrome. Any practices that reduce soil compaction will certainly help reduce SDS. What if a field has had both SDS and white mold disease in past? For fields that have had both SDS and white mold infestation in the past, use of tillage or no-till does not matter. That's because tillage impacts the two diseases in opposite ways. If you know which disease had the higher occurrence in a particular field, you can make your decision accordingly. Because you would not be able to predict which disease is going to be prevalent next summer, the two diseases pose the same risk as they both can reduce yield significantly if an outbreak occurs. This decision matter is also applicable to soybean variety selection, which needs a full article for a discussion in future. X.B. Yang is an ISU professor of plant pathology and SS Navi is an assistant scientist at ISU with responsibilities in soybean disease research.